Home > Google News > Google Maps > Google Maps Quality Guidelines Updated But Will Google Enforce Them? Jade Wang from Google announced last night in the Google Business Help forum that they've updated their quality guidelines for local pages. 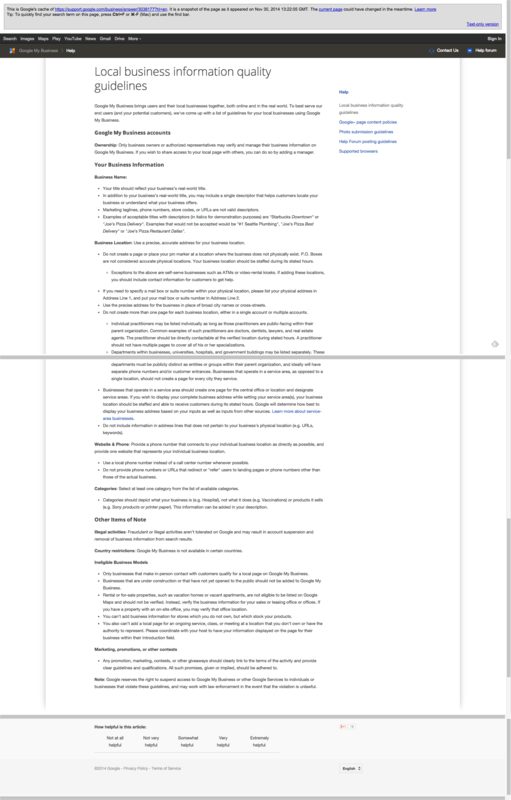 The new guidelines are pretty much completely revamped, in fact, you can compare the new guidelines to the old guidelines (here is a screen shot). (1) Descriptors are no longer allowed in the business name. So you cannot say, Company Name SEO Firm, in your company name field. (2) Select few categories and do not select keyword based categories. (3) Virtual offices like Regus are now specifically excluded. (4) If you have different departments, they are to have their own page they must have unique categories. Mike Blumenthal has gone through them in more detail on his blog as well. The big question, will Google enforce these rules? Forum discussion at Google Business Help & Local Forums. Previous story: Google To Support iOS For App Indexing? I'd Think So.